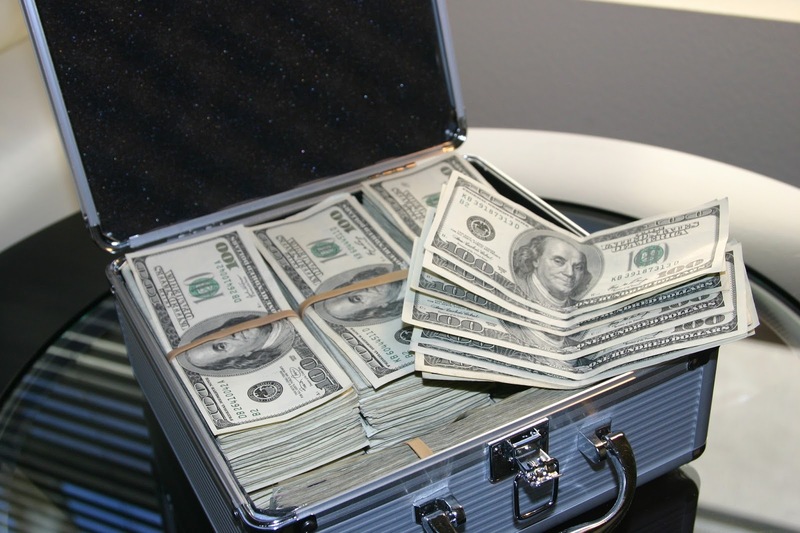 While cash flow is more important when it comes to financial independence, it's still good to look at the balance sheet too, which is why I provide these net worth updates. Since more and more of my net worth is tied to the markets, there's a larger correlation between my net worth and the markets, but in the long run as I continue to save and invest the net worth trend should be higher even though short term fluctuations can vary wildly. As a dividend growth investor I'm not overly concerned with the short-term gyrations as long as the dividend stream remains in tact, but the markets' effect is noticeable. The S&P 500 added another 3.0% in August and my net worth followed suit thanks to the markets, dividends and most importantly savings. The S&P 500 actually became the longest bull market/economic expansion in history during the month too. During August my net worth increased $8,446.09. When the markets move my net worth follows and that was very much the case for July. That's now 4 consecutive months of increases after the 2 months of decline earlier this year. For the month my net worth increased 2.85% and YTD it's climbed 7.24%. Our main financial target for 2018 is to pay down our non-mortgage debt. There's a variety of things that just kind of came up as life happened. Some medical debt, a vehicle, an unexpected new air conditioning for the house. Nothing out of the ordinary, but burdensome nonetheless. At this time it doesn't make much sense to pay extra on the mortgage given our relatively low interest rate as well as the tax break on mortgage payments and think we'll come out much further ahead investing the extra cash flow. So the liabilities side of the net worth equation will be slow moving. However, once the FI portfolio is able to get to a self-sustaining level of dividends then the plan is to aggressively pay down the mortgage. 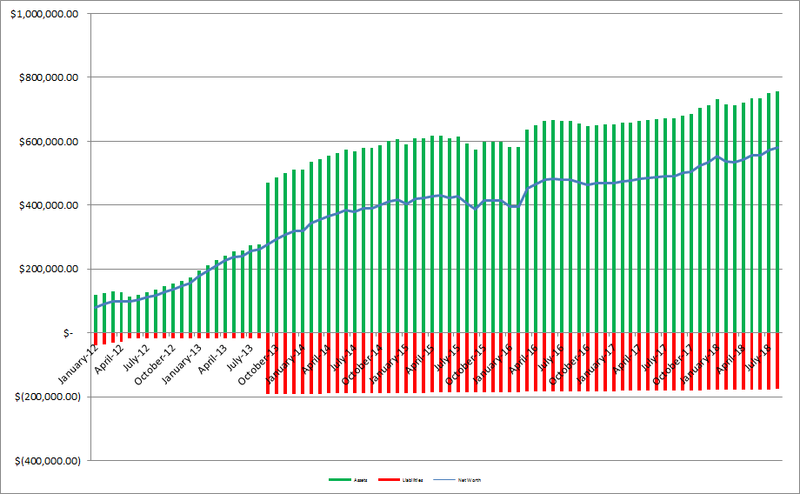 As of the end of August we have 26.7% equity in our house based on our purchase price from 2013. However, according to Zillow our house has increased in value around $35.3k from our purchase price which is a nice bonus, although I keep the purchase price as the value in the net worth equations. 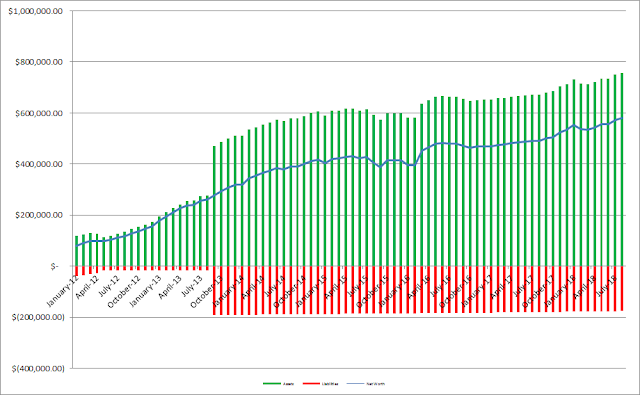 Based on Zillow's estimate the equity in our house jumps to 36.9%. 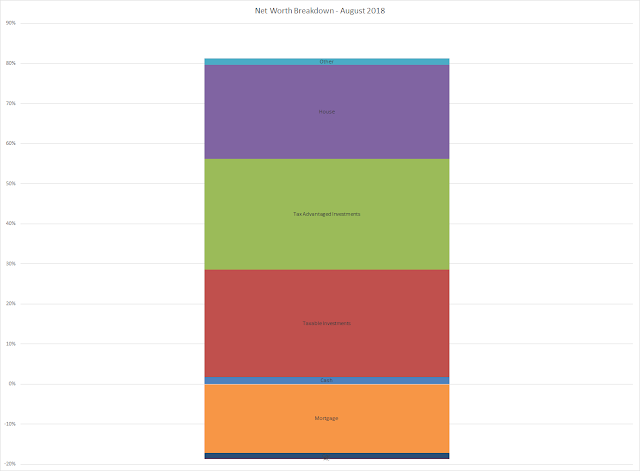 In order to give you a general idea of the breakdown of net worth I've started including a % breakdown of our net worth with each monthly update. The assets are broken down into cash, taxable investments, tax advantaged investments (401k, Traditional & Roth IRAs), house (using our purchase price) and other which covers things like our cars and various collectibles from when I was a kid (they don't really move the needle at all but I have them in my spreadsheet because I was bored). It's been a long time coming but I think there's a very real possibility of us being debt free, except the house, by Christmas. Since I write so much (or at least try to) about investigating companies as an investment I figured it'd be fun to see how our balance sheet looks. 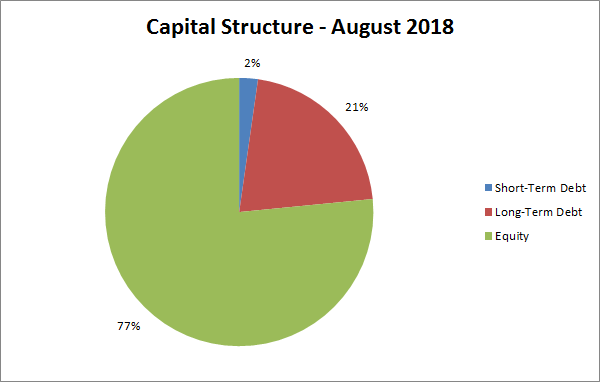 As of the end of August our debt to equity ratio is 30% and our debt to total capitalization is 23%. Not bad, but I'd love to get that debt down to ZERO! How did your net worth do in August? Did you continue to ride the markets higher to new personal bests? Is BlackRock Finally Looking Attractive?